BROWARD COUNTY, FL - The first shipment of Colombian Hass avocados into the United States arrived today at Broward County&apos;s Port Everglades. The shipment marks the culmination of years of work by Colombia to gain access to the lucrative U.S. market. 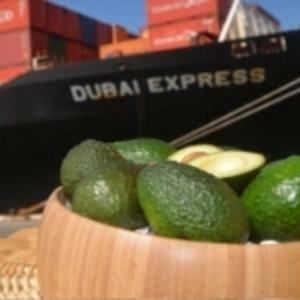 The inaugural shipment of avocados left Cartagena on November 2 aboard Hapag-Lloyd&apos;s Dubai Express bound for the United States, just two months after the U.S. Department of Agriculture opened access for Colombia as a source of the popular fruit. "We have been actively expanding our perishables market for years, and this is a huge welcome for produce from Colombia," said Steven Cernak, Chief Executive and Port Director of Port Everglades. "Port Everglades is the leading perishables seaport in Florida with easy access to 19 million consumers in the region." Approximately 18 metric tons of avocados were loaded into a cargo container at the Port of Cartagena, Colombia and set sail directly to Port Everglades, Florida. The shipment will be transported by truck to Mission Produce&apos;s distribution center in Atlanta, Georgia. "We celebrate this major achievement of the commercial relations between the United States and Colombia," said Juan Barrera, Executive Director, U.S. Agribusiness, PROCOLOMBIA. "Today marks a historical event for Colombian agriculture and we are excited of the years to come." At the crossroads of north-south and east-west trade, Broward County&apos;s Port Everglades is Florida&apos;s leading container port, handling more than one million TEUs (20-foot equivalent units, the industry standard measurement for container volumes) and serving as a gateway to Latin America, the Caribbean, Europe and Asia. Located within the cities of Fort Lauderdale, Hollywood, and Dania Beach, Florida, Port Everglades is in the heart of one of the world&apos;s largest consumer regions, including a constant flow of approximately 110 million visitors statewide and 6 million residents within an 80-mile radius. Port Everglades has direct access to the interstate highway system and the Florida East Coast Railway&apos;s 43-acre intermodal container transfer facility, and is closer to the Atlantic Shipping Lanes than any other Southeastern U.S. port. Ongoing capital improvements and expansion ensure that Port Everglades continues to handle future growth in container traffic. A world-class cargo handling facility, Port Everglades serves as an ideal point of entry and departure for products shipped around the world. More information about Broward County&apos;s Port Everglades is available at porteverglades.net or by calling toll-free in the United States 1-800-421-0188 or emailing PortEvergladesCargo@broward.org.